New York's Tappan Zee Bridge, which is likely to be replaced soon, is being reimagined for alternative uses. One such use that is becoming increasingly attractive to New York residents is to turn the 56 year old bridge into a public park. The potential of such a project has already been compared to Walkway Over the Hudson, a reclaimed mile-long railway bridge linking Poughkeepsie and Highland, and New York City's High Line, the popular west-side park built on 1.45 miles of disused elevated rail structure. 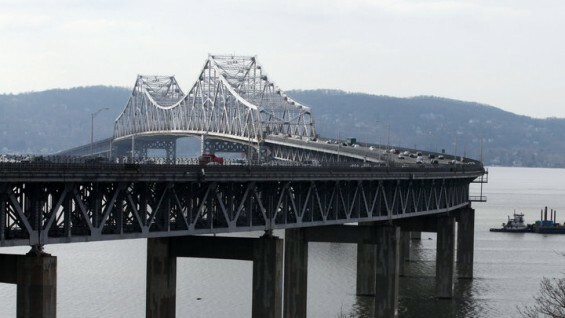 Even New York Governor Andrew M. Cuomo called the prospect of turning the Tappan Zee into a park an "exciting option" in February. One drawing envisions a sprawling Seurat-like park scene with the towers of Manhattan beckoning in the distance. Others call for two ghost piers beginning at opposite sides over the river but not meeting, elegantly terraced gardens and plantings, a simple walkway surrounded by wind generators, photovoltaic cells and other examples of green energy. The idea of turning the existing Tappan Zee Bridge into a walkway and park when a new bridge is built remains more alluring dream than likely reality, though when Gov. Andrew M. Cuomo declared it in February to be an “exciting option,” that seemed to guarantee it would at least get serious scrutiny. But since the proposal was floated last fall by Paul Feiner, supervisor of the Town of Greenburgh in Westchester County, enough people have become entranced by the idea that some have been imagining what it might look like, and have put those imaginings on paper.